This wonderful gentle soap is made with Calendula infused olive oil and the orange Calendula petals mixed into each bar add a cheerful look. 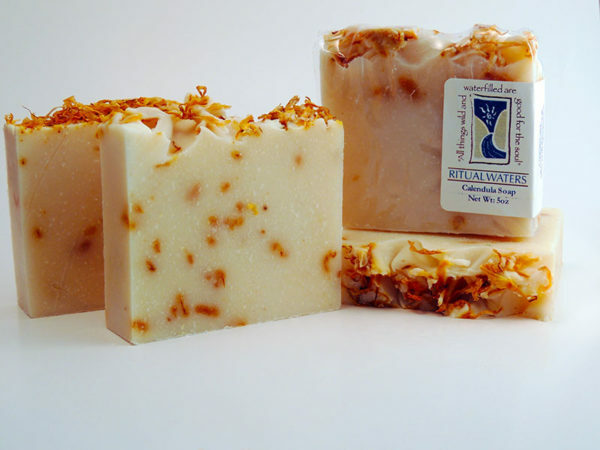 Calendula the herb has many great benefits and added to these bars makes this a great soap for dry and irritated skin. Since there is no scent, this is a great bar for those with scent allergies and for young children. Ingredients: Saponified oils & butters of Olive infused with Calendula Flowers, Coconut, Cocoa & Shea Butters, Avocado Oil, Calendula Flowers for bit of Color. Castor & Meadowfoam Oils for extra moisturizing. There are no essential oils in this bar. The Olive Oil used in this blend is infused with Calendula Flowers which are a gentle healing herb. Use this soap for those with sensitive skin like young children and babies.